Getting lost at a theme park is frustrating. Getting lost at a hospital can turn an already unpleasant experience into a deeply stressful one. Hospital signage, something many visitors and even hospital staff take for granted, comes in many forms, all of which can go a long way in improving the patient experience — if it’s properly customized for individual facility needs and integrated into existing hospital systems. The value that digital signage provides begins in the waiting room, where patients often spend large amounts of downtime flipping through outdated (and likely germ-contaminated) magazines. Facilities can use signage in waiting areas to distribute important information about hospital cleanliness, health information or even specialized educational content tailored to a facility’s needs. When a patient is navigating a facility, information becomes even more important. Hospitals are often large and confusing, which can be distressing when patients and families are dealing with health challenges. Kiosks for check-in and navigation help cut down on negative emotions and direct visitors to their desired destination via diagrams, directions and physician directories. Innovative hospitals are using digital technology to keep patients happy and healthy. Even as many facilities are just bringing their signage into the digital era, things are changing. 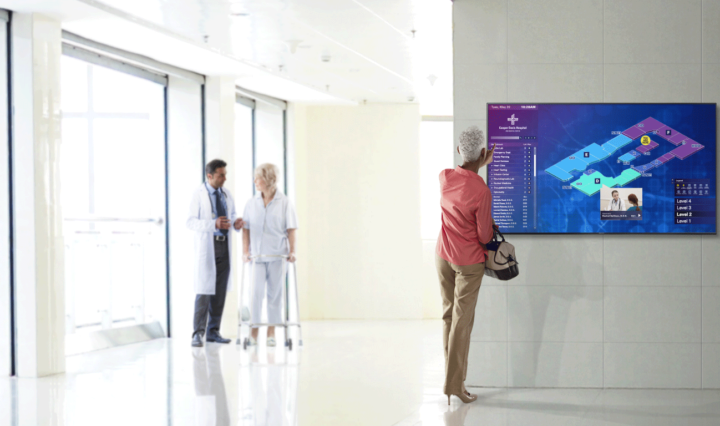 One of the most exciting advancements in digital signage today focuses specifically on helping patients better navigate healthcare environments. One example is the AHA-endorsed wayfinding solution by Gozio, which offers facility visitors GPS-style directions via kiosks, tablets or mobile apps. The solution brings patients the peace of mind of indoor, turn-by-turn navigation through the use of sensor fusion technology that works with a mobile device’s motion, electromagnetic and orientation sensors. The platform also includes tools for leadership through a feature that allows hospital staff to access analytics. This opens up insight into how visitors move through the facility. This level of insight into a patient’s real-time experience within a facility adds yet another layer of potential to recent efforts to better understand, respond to and improve the overall patient journey. Many hospitals are already using special patient engagement software to communicate with patients to schedule appointments. It’s no stretch to imagine a situation in which the patient’s journey, from leaving their house to meeting with their clinician at a medical facility, is handled through one system that could also collect feedback for the facility along the way. The Gozio app is already bridging this gap through its wayfinding system and includes appointment notifications, a physician director, a parking location reminder and even a follow-up survey feature that can be used by hospitals to gather patient feedback. Optimal solutions will incorporate “progressive disclosure,” which is a comprehensive program that controls the information the patient is exposed to so they get the information they need when they need it. In the future, expect to see more advancements in wayfinding, including the use of haptic devices that allow users to feel textures on touch screens and possibly even in mid-air. Facilities that are able to find the balance between digital and traditional signage through a properly implemented program can dramatically improve patient satisfaction. From check-in to discharge, technology can play a pivotal role in every aspect of the patient experience. Here are five ways mobile devices can improve patient care.